On Friday 29 May, 62 students from a variety of high schools across Melbourne descended on Bendigo for the annual Model United Nations Assembly (MUNA). The MUNA is a rotary operated and funded debating weekend that involves students in years 10, 11 and 12. Each participating school was required to nominate a team of two to three students. 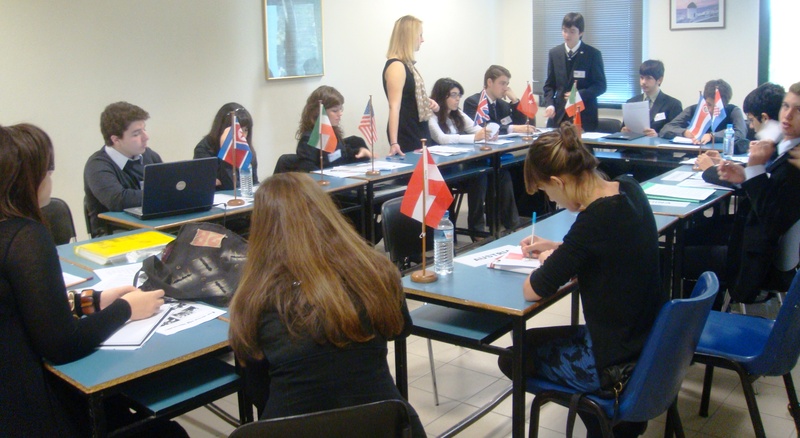 These students were then allocated a country to represent for the duration of the weekend. I was nominated, along with my classmate Macadie, to represent our school. Our allocated country was India, which through research I learned is the world’s largest populated democratic country. The resolutions to be considered for discussion were sent out to each team six weeks prior to the MUNA weekend. Macadie and I researched issues and information about India. We worked together to form arguments for the MUNA resolutions, making sure to accurately model India’s present opinion on certain topics, and maintain our representation of the country and their government. I also sought out help from some of the tutors while attending The Centre’s global homework program. The extra assistance was great, especially in the days before the weekend. Eventually 29 May came around, and Macadie and I arrived in Bendigo as the delegates of India. All 62 of us were introduced to the rules and regulations of the assembly. There was an amazing variety of cultures forming the body of our Model United Nations Assembly. That this assembly insists that all member states enact and enforce laws that give full equality status to women. That this assembly is to set up an ongoing United Nations body fully resourced to independently and uniformly measure the temperature of the planet with a view of regularly reporting to this assembly so that important environmental measures in the future, such as targeted reduction of carbon emissions, are based on the most credible data available. That this assembly calls on all countries to immediately cease the cruel and barbaric use of capital punishment in any offence. That this assembly calls upon the United States of America to amend its constitution so as to strictly limit access to firearms as matter of child and community health. We were one of the youngest teams among a majority of older and slightly intimidating year 11s and 12s. It was great to find that neither Macadie nor myself were intimidated or mocked, instead we were welcomed by many of the older students. I met some great people with the same hardworking attitude and high aspirations as myself. Overall, the entire weekend was a fantastic learning experience. The chance to observe the brilliant speaking and debating skills of older students motivated me to assess my own skills and confidence so that I can improve. I would definitely recommend attending this MUNA if you are given the opportunity. I had a great time and returned home with new friends and a newfound interest for debating.